Tinnitus is a symptom of the ear that is characterized by high-pitched ringing sounds. According to the American Academy of Otolaryngology, 36 million people in the United States have tinnitus or a similar head condition. Tinnitus is difficult to diagnose at times because the severity varies. You might hear sharp sounds occasionally in one ear or constantly in both ears. In addition to medical treatment, regular exercise can decrease the occurrence of tinnitus. There are several causes of tinnitus, which is not a medical condition in itself but a symptom of another condition. 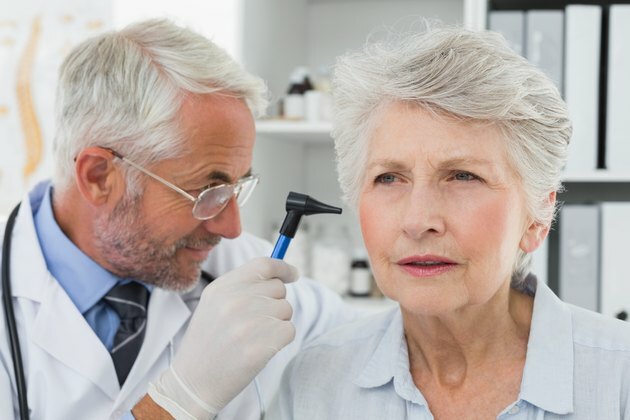 Ear and head injuries, earwax buildup, stress, hypertension, ear infections, poor diet, acoustic neuroma, Meniere's disease, lack of exercise and an exposure to loud noises are all causes of tinnitus. Damage to the inner ear as a young adult can cause tinnitus later in life. The Mayo Clinic says that some medications that affect the blood flow in the body can aggravate tinnitus. These include cancer medications, aspirin, diuretics and antibiotics. Exercise is a range of physical activities that helps you strengthen your heart and maintain your weight. Another important benefit of exercise on the body is an increase in blood circulation. This decreases your risk of hypertension and cardiovascular disease. Increased blood circulation also reduces the occurrence of tinnitus, according to the American Academy of Otolaryngology. Relaxing exercises such as yoga and meditation can be utilized as part of your exercise routine to help relieve tinnitus. These exercises also increase blood circulation. They can also decrease turbulent blood flow in the body, which you can hear within the ear. The American Academy of Otolaryngology recommends daily exercise as a means of controlling tinnitus. Improvement in blood circulation reduces the noise you hear that is related to blood vessel contractions. If you are new to exercise, start off slowly and gradually increase the amount overtime. Try something you like so you will stick with it. Walking, running, swimming and dancing are examples. Exercises can relieve tinnitus. However, working out alone does not treat this ear condition. A medical doctor, particularly an otolaryngology--ear, nose and throat--specialist can treat this condition. The Mayo Clinic says occasional tinnitus generally does not indicate a serious medical condition. If you have tinnitus, it will likely worsen as you age. Tinnitus is also aggravated during times of stress. The Mayo Clinic recommends exercise as both a means of stress and tinnitus relief. See your doctor if tinnitus is constant and causes sleep difficulties, anxiety, extreme fatigue and depression. Why Do My Ears Hurt When I Exercise?